(York, Pa., June 3, 2017) - The contract of standout York Revolution reliever Jarret Martin has been purchased by the San Francisco Giants, the Revolution announced today. The left-hander will join the Giants’ Triple-A affiliate in Sacramento as he seeks to add to the list of former Revs to advance to the Major Leagues. Martin was one of the Atlantic League’s most dominant relievers during his time in York, posting a 0.98 ERA with four saves over 18 outings. The 6-foot-4-inch southpaw allowed just nine hits in 18.1 innings, while striking out 27 batters. He was nearly unhittable from May 5 on, allowing one hit in 12.1 innings over his final 12 appearances. He earned the save in each of his final three outings and struck out 13 while walking just one in 6.1 innings over his last six appearances. His only two earned runs allowed came in his first two appearances, and he exits York on a streak of 16 consecutive appearances without allowing an earned run. The 27-year-old will pitch in his home state with the Triple-A Sacramento River Cats. The Bakersfield, CA, native was originally an 18th round draft pick of the Baltimore Orioles in 2009 and spent two seasons in the Orioles system before being dealt to the Los Angeles Dodgers, where he would spend the next three years. Martin was a Midwest League All-Star as a starting pitcher in 2012 and was added to the Dodgers’ 40-man roster following the 2013 season. 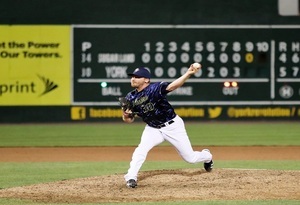 Martin excelled in relief for two seasons at Double-A and, after rebounding from a shoulder injury in 2015, returned to form with York in 2017. Martin is the first member of the Revs to have his contract purchased by a Major League organization in 2017 and the 37th to have his contract purchased in-season in Revolution history, the first by San Francisco. He will look to become the ninth in Revs history to go from York to the Major Leagues. Revolution infielder Josh Wilson was signed by the Texas Rangers organization just before the start of spring training this year.